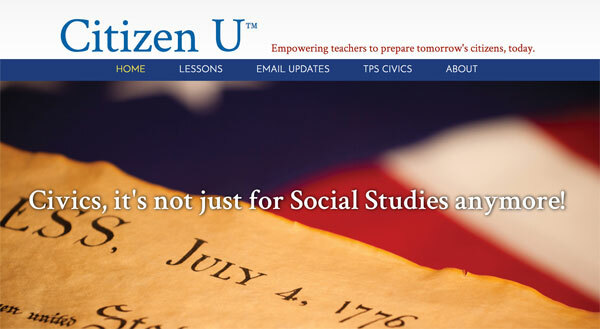 Citizen U integrates inquiry-based civics across core curriculum disciplines—English-language arts, math, science, and social studies—in elementary, middle school, and high school grades. Created through a grant awarded by the Library of Congress Teaching with Primary Sources TPS program, Citizen U is a collaboration of the Barat Education Foundation, the Constitutional Rights Foundation, and DePaul University’s Office of Innovative Professional Learning. Get the Lessons! Download a lesson today, check it out, and let us know what you think. With the help of educators like you, we are rebuilding civics learning. Once a month, we will randomly select one of you to receive a gift card reward as a small token of our appreciation. Today’s generation of students is more politically aware and energized than any since the 1960s, but lacks the basic understanding of civics and civic action to fully support our democratic traditions, at a time when we need a fully engaged and informed citizenry, including teens and children, to preserve and protect all that we as educators hold dear. The American public education system was originally developed to create good citizens, not good workers, able to take part in shaping and determining the direction of the country. We believe it’s time to return to that foundation throughout K-12 curricula. By employing Citizen U lessons in your classroom, you can not only help foster critical understanding that has been lost as civic education has been pushed aside in today’s high stakes testing environment, but based on our initial testing of these lessons in the field, we believe they will help make the subjects that you teach more meaningful, relevant, and engaging in your students’ eyes. We will be publishing testimonials, video demonstrations and other research to this effect in the space below. Our hope is that these materials, and the set we’re working on now, will serve as model and inspiration for many more. Our ultimate goal is to support the development of lesson plan libraries and other resources that contain potential civic integrations and extensions for every topic in every K-12 subject. We’ll also be providing stipends and professional development opportunities for educators who want to help improve the quality of our existing lessons through classroom use. Please sign up for email updates to get civic education updates, including breaking news; primary source collections; new ideas from research and the field; free professional development; classroom materials, rewards, and more. Each Citizen U lesson is tightly correlated to national standards in English language arts, science, mathematics, and/or social studies, especially those employed in the development of high-stakes state and national exams. Because they increase the level of engagement and meaning associated with the topics they cover, we believe they can’t help but improve performance in these areas, and will be publishing testimonials and research to this effect from your fellow principals and district leaders in the space below. Beyond this, our lessons are designed to inculcate a wide variety of skills necessary for success in the 21st century, including collaboration, creativity, critical thinking, problem-solving, information literacy, communication, leadership, social responsibility and, of course, civic literacy itself. From past experience, we know that civic literacy in the classroom environment can quickly spread to the surrounding school community while enhancing school culture (see e.g. Our American Voice), providing support, in turn, to your institutions at a time when education is under fiscal siege. We hope that you will join the growing network of school districts using programs like Citizen U and OAV to invoke the spirit of our field’s ancient root, educare, “to lead out.” For more information, to keep apprised of opportunities for your schools, and for all developments in the whole civics movement, please sign up for email updates. We look forward to working with you.